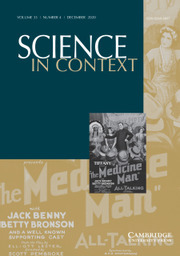 Science in Context is an international journal edited at The Cohn Institute for the History and Philosophy of Science and Ideas, Tel Aviv University. It is devoted to the study of the sciences from the points of view of comparative epistemology and historical sociology of scientific knowledge. The journal is committed to an interdisciplinary approach to the study of science and its cultural development - it does not segregate considerations drawn from history, philosophy and sociology. Controversies within scientific knowledge and debates about methodology are presented in their contexts.